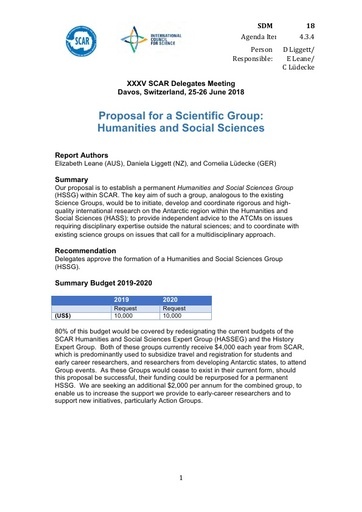 Our proposal is to establish a permanent Humanities and Social Sciences Group (HSSG) within SCAR. The key aim of such a group, analogous to the existing Science Groups, would be to initiate, develop and coordinate rigorous and high quality international research on the Antarctic region within the Humanities and Social Sciences (HASS); to provide independent advice to the ATCMs on issues requiring disciplinary expertise outside the natural sciences; and to coordinate with existing science groups on issues that call for a multidisciplinary approach. Delegates approve the formation of a Humanities and Social Sciences Group (HSSG).